by Musee national des beaux-Arts du Quebec Staff, Fossey, John M., Francis, Jane E.
Musee national des beaux-Arts du Quebec Staff, Fossey, John M., Francis, Jane E.
When Olga and Vincent Diniacopoulos arrived in Montreal from Post-War Europe, they brought with them more than two thousand antiquities. Yet Canada's largest private collection, held since the 1960s at Universite de Laval and now in the Musee national des beaux-arts du Quebec, remained largely unknown and unstudied. In 2004 Concordia University - in conjunction with the Montreal Museum of Fine Arts - arranged for an exhibition, an international conference and a publication devoted to the collection. Ten essays, seven in English and three in French, explore various aspects of a collection ranging from Greek pottery of the Late Bronze Age to ancient glass of Roman imperial date. 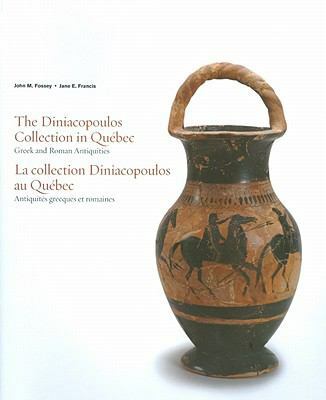 Accompanied by a complete catalogue of all the Montreal pieces.Musee national des beaux-Arts du Quebec Staff is the author of 'Diniacopoulos Collection Greek & Roman Antiquities', published 2004 under ISBN 9780889474185 and ISBN 0889474184. Loading marketplace prices 4 copies from $15.50 How does the rental process work?